V.3 Selenium oxides and hydrides in aqueous solution. Solid selenious acid and selenic acid. In order to quantitatively predict the chemical reactions that hazardous materials may undergo in the environment, it is necessary to know the relative stabilities of the compounds and complexes that may be found under certain conditions. 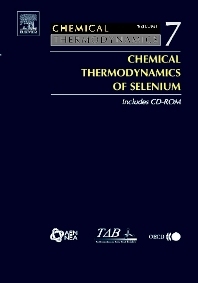 This type of calculations may be done using consistent chemical thermodynamic data, such as those contained in this book for inorganic compounds and complexes of selenium. Fully detailed authoritative critical review of literature. Integrated into a comprehensive and consistent database for waste management applications. Environmental Chemists, Geochemists, Physical Chemists, Analytical Chemists and Waste Management Engineers.